Before we get into the news of the week, we always like to talk about the games we have been playing. Adam and Zack go deep into the engrossing experience of No Man's Sky that has rebounded since the release of the recent NEXT update. Meanwhile, James shares his thoughts on fighting games and visual novels (particularly Umineko: When the Seagulls Cry). And then we get into the news of the week! 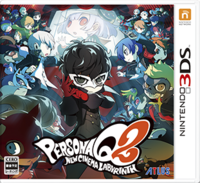 There a couple big announcements as Atlus unveiled Persona Q 2: New Cinema Labyrinth just earlier this morning, while Sony dusted off their Arc the Lad property to bring us Arc the Lad R for mobile. Meanwhile, Square Enix is trying to make good on the plagued release of Chrono Trigger for PC by releasing the "final major update", though we hope they continue to improve on it. All that and more on the latest edition of the Tetracast! This edition of the Tetracast features James Galizio (@theswweet), Adam Reese (@amreese), and is hosted by Zack Reese (@zackreese). As always, you can find links to the full episode of the podcast below along with our RSS feed, and also subscribe to us on iTunes or Google Play. 01:09:10 - Chrono Trigger PC "final major update"